As with any Mississippi summer, you are probably looking for ways to beat the heat! With temperatures climb higher, we’re all looking for some ways to cool down. Getting into a hot car and taking a long road trip in a warm car can feel even worse. 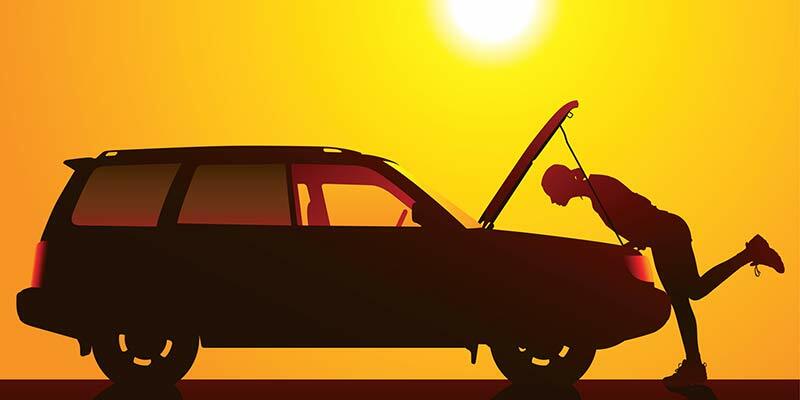 BUT ~ so is having your car break down and needing emergency roadside service with the sun beating down on you. Before your long driving trip, (or each time you get gas) make sure to check your tire pressure. Because the tires are filled with air, the tires will expand when driven and parked in the sun. Your tire pressure not only impacts your gas mileage, but it keeps your tires ‘cooler’ and will also have an effect on the performance of your car. Make sure your tires are not over inflated because of the heat expansion. Most importantly make sure your tires are not UNDER inflated. The air in tires are designed to keep you tire from reach high enough temps to destroy your tire. UNDER INFLATED TIRES is the #1 cause for blowouts on the highway. A lot of times you can tell by just looking at the tire. You have to use a good gauge to know if your tire is aired up properly. You can drop by one of our locations during business hours and we will be happy to check your pressure and make any adjustments to the pressure if needed. Do not head out for a long road trip without checking your air conditioner in extreme heat. Our ASE technicians will make sure your coolant and all air conditioning parts are working well and can endure a long trip. No matter where you go, we hope you have a safe (and cool) summer.